Conservatives won a small, largely unsung victory in the US House of Representatives today. Thanks to them, the House passed a version of the Farm Bill with the Supplemental Nutrition Assistance Program -- food stamps -- removed. From a libertarian viewpoint, the the idea of the government manipulating the food market at all is highly negative... but in these times even an illusory and temporary victory is a notable event. Following not too far from the minor conservative abortion win in Texas, the event carries an astrological configuration not too different from the last. There is no doubt the Democrats will eventually get their way on SNAP -- the Republicans these days always capitulate. Nevertheless, the chart for this event is of some interest. This is an authoritarian chart. The advancement of any legislation extending the influence of authority, even if that authority is temporarily and partially muted, is inherently anti-libertarian. So it comes to no surprise that Pluto is quindecile Pallas and opposite Mercury, ruler of Pallas. The battle over finances is prominent. Though the time is approximate, we can more or less assume that Venus, ruling money, is at the top of the chart. She is, as in the previous chart, square the Nodes, signifying a battle over direction. Her ruler the Sun is sesquiquadrate Neptune (the Left) and trine the North Node (the Right, when affecting Venus). The victory is Pyrrhic, the real winner unclear after the costs are counted... but we all know that our rulers in DC were never good at counting. Saturn is rising, perhaps symbolizing a slowdown or blockage of "business as usual". 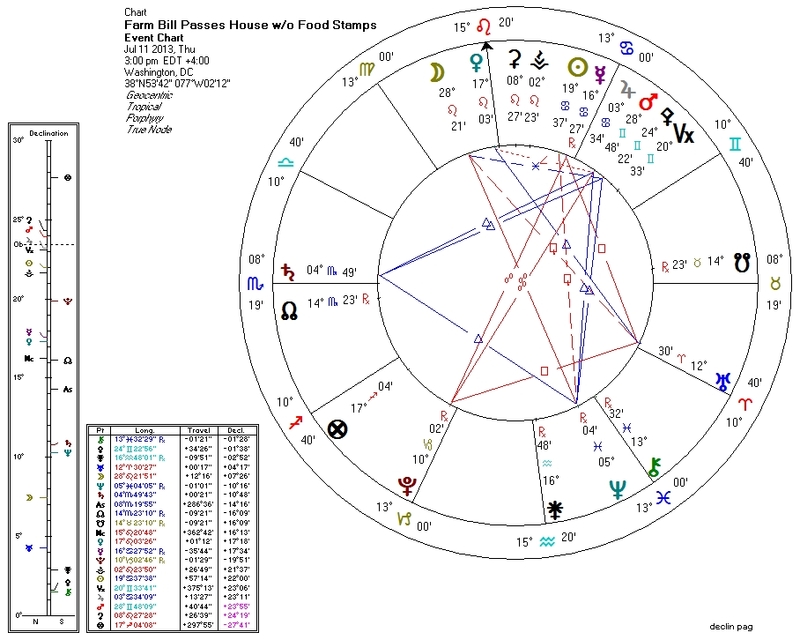 The Sun-Mercury conjunction in Cancer, symbolizing women's issues in the eighth house in the previous chart, can be seen to stand for food and agriculture (Cancer) in the public sphere (the Ninth House) in this chart. Uranus in aspect to most of the chart signals unpredictability and upset. Finally, the two rulers of the political Right, the Moon and Venus, both shine in the Tenth House of politics. They are compromised by Neptune, and their moment in the spotlight together will be brief, but being that they are in Leo at the moment, one can easily imagine Republicans on the Hill gloating and back-slapping over expensive drinks tonight. They will give in to the welfare state, as they always do eventually, but perhaps not before winning some minor concessions for their districts from the temporarily defeated Democrats.